Our Easy Chocolate Frosting is a great pick for cakes, cupcakes, cookies and more. Let's get spreading! Beat butter in large bowl with mixer until creamy. Add 2 cups sugar gradually, beating after each addition until light and fluffy. Add melted chocolate and vanilla; beat until blended. Beat in remaining sugar alternately with milk. 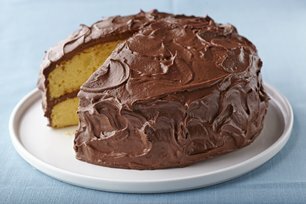 This easy-to-make recipe makes 2-1/2 cups frosting - enough to frost tops and sides of 2 (8- or 9-inch) cake layers, top and sides of 13x9-inch cake, tops of 3 (8- or 9-inch) cake layers or 24 cupcakes. Substitute 6 oz. Baker's Semi-Sweet Chocolate for the 4 oz. Baker's Unsweetened Chocolate. If frosting becomes too thick, beat in additional milk by teaspoonfuls until of spreading consistency.